Hertfordshire Police posted a photograph of one of their Inspectors as part of an appeal to trace a wanted man. 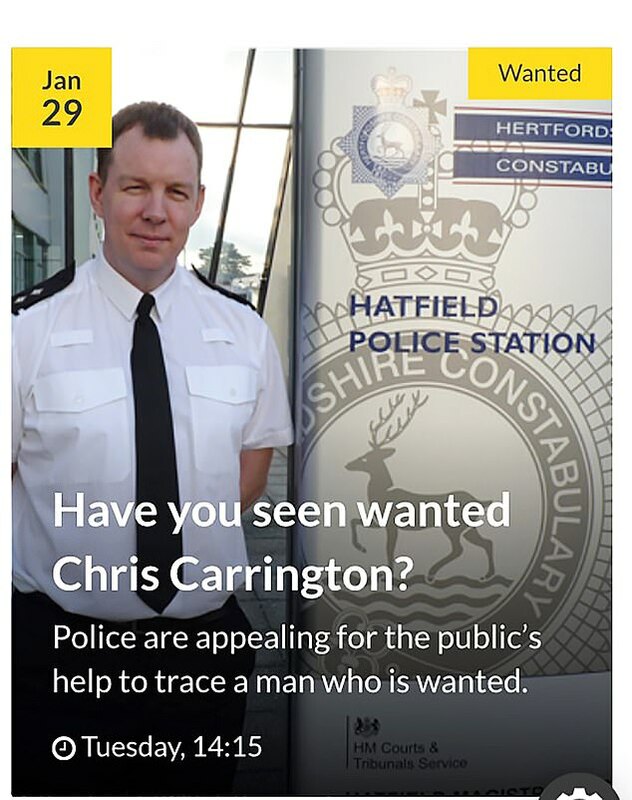 The force’s website published a picture of Welwyn Hatfield’s new Neighbourhood Inspector Wayne Nash in uniform outside Hatfield police station with the word ‘Wanted’ in the corner of the picture. The text accompanying the image was an appeal to find Chris Carrington, aged 25, of no fixed address, who is wanted for grievous bodily harm (GBH) and has connections to Bovingdon and Hemel Hempstead. The copy said: ‘This picture of Chris was taken in 2014 so his appearance may have changed. It continued: ‘Anyone who sees him or knows of his whereabouts is asked to contact Hertfordshire Constabulary via the non-emergency number 101 or online. The blunder was mocked by residents of the county who spotted the mistake. 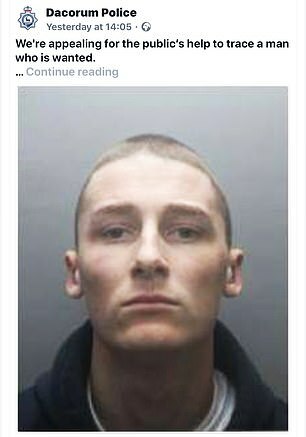 A police spokesman said: ‘An incorrect image was shared of a serving police officer with our wanted appeal for Chris Carrington on Facebook and on our website. Inspector Nash joined the police service in 2001 and only became part of the Welwyn Hatfield Safer Neighbourhood Team a few weeks ago.